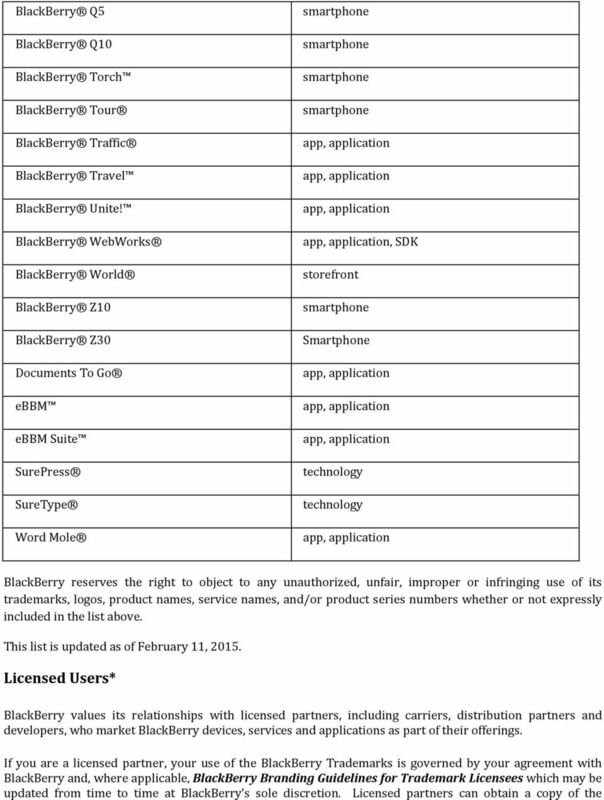 Download "BlackBerry Trademarks Public Use Guidelines"
2 6. 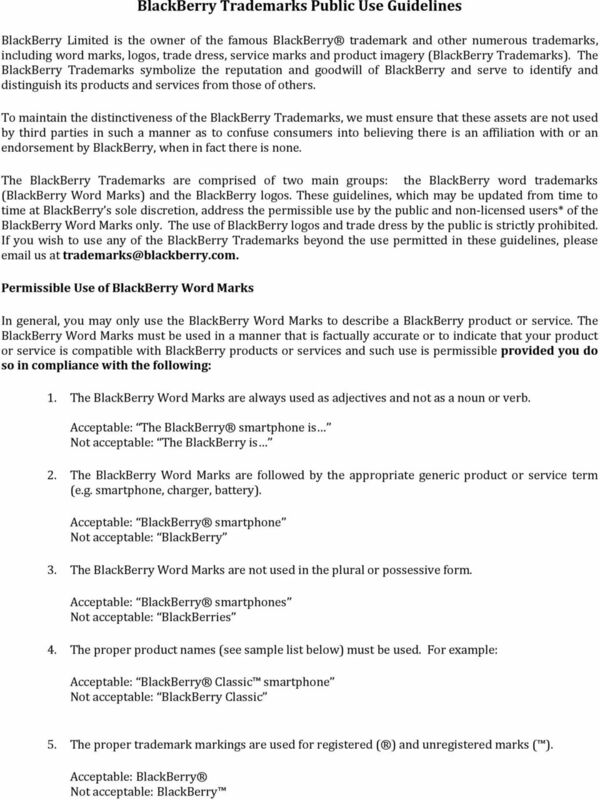 The proper notice attributing ownership of the trademarks to BlackBerry is included. [BlackBerry Trademark used] is the trademark or registered trademark of BlackBerry Limited, the exclusive rights to which are expressly reserved. [User Company Name] is not affiliated with, endorsed, sponsored, or otherwise authorized by BlackBerry Limited. Referential or Nominative use of the BlackBerry Word Marks is not permitted in the following contexts: 1. As part of your website, domain name, product or service name, trade name or corporate name (e.g In a manner that might impair, jeopardize, violate, infringe or bring into disrepute the BlackBerry Word Marks or related BlackBerry intellectual property or other rights. 3. In a manner that is harmful, obscene, disparaging, defamatory, objectionable or libelous to BlackBerry, its products or services, affiliates, partners or any other person. 4. In a manner that directly or indirectly suggests sponsorship, affiliation or endorsement of your company, product or service by BlackBerry. 5. When the BlackBerry Word Marks are a prominent visual element used in association with your product or service. 6. It is not permissible to use a variation, abbreviation or takeoff of the BlackBerry Word Marks. For example, BlackBerries is not acceptable use with reference to any products or services of BlackBerry. By using the BlackBerry Word Marks, in whole or in part, you are acknowledging that BlackBerry is the sole owner of the trademarks and promise that you will not interfere with BlackBerry s rights in the trademarks anywhere in the world. Any use of the BlackBerry Word Marks in a manner that is inconsistent with these Guidelines is unauthorized. 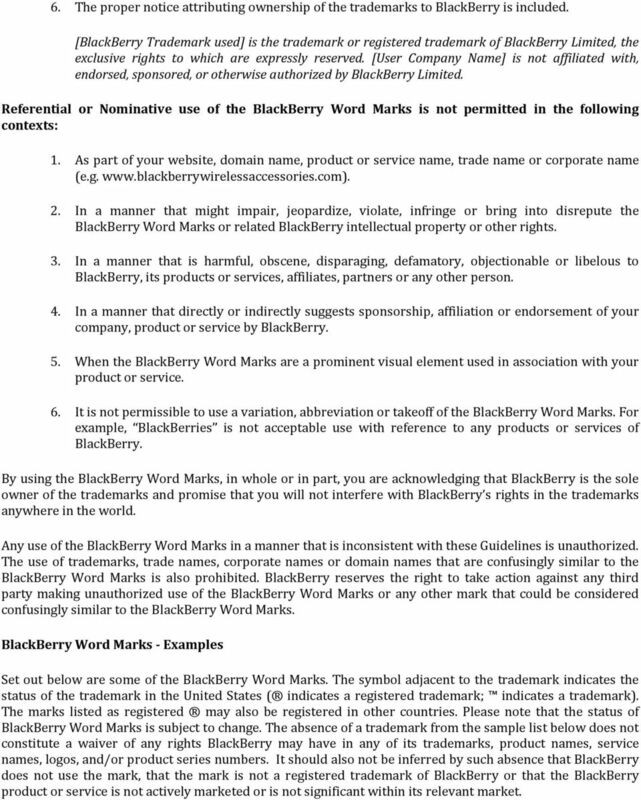 The use of trademarks, trade names, corporate names or domain names that are confusingly similar to the BlackBerry Word Marks is also prohibited. BlackBerry reserves the right to take action against any third party making unauthorized use of the BlackBerry Word Marks or any other mark that could be considered confusingly similar to the BlackBerry Word Marks. BlackBerry Word Marks - Examples Set out below are some of the BlackBerry Word Marks. The symbol adjacent to the trademark indicates the status of the trademark in the United States ( indicates a registered trademark; indicates a trademark). The marks listed as registered may also be registered in other countries. Please note that the status of BlackBerry Word Marks is subject to change. 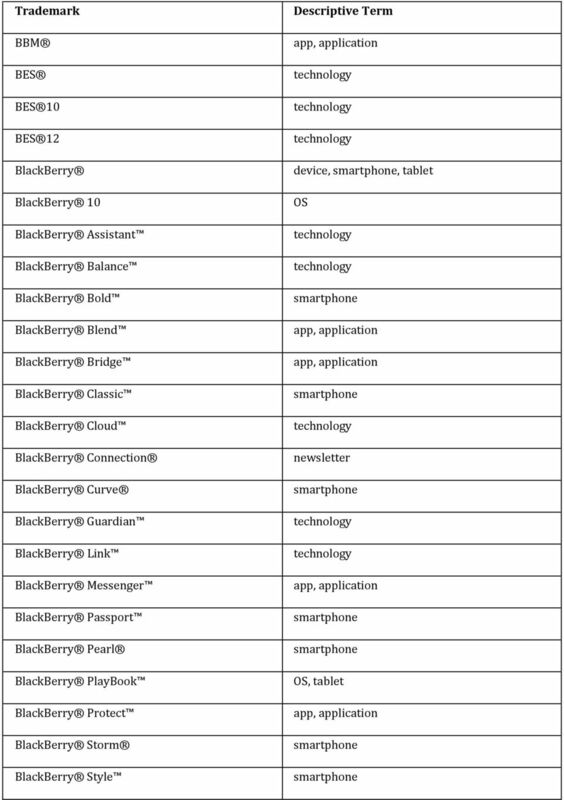 The absence of a trademark from the sample list below does not constitute a waiver of any rights BlackBerry may have in any of its trademarks, product names, service names, logos, and/or product series numbers. It should also not be inferred by such absence that BlackBerry does not use the mark, that the mark is not a registered trademark of BlackBerry or that the BlackBerry product or service is not actively marketed or is not significant within its relevant market. 5 BlackBerry Branding Guidelines for Trademark Licensees by contacting your authorized representative of the BlackBerry Brand Marketing Team. If you have any questions or concerns, please feel free to reach out to us at: 2015 BlackBerry Limited. Trademarks, including but not limited to BlackBerry, Emblem Design, BBM and BES are the trademarks or registered trademarks of BlackBerry Limited, the exclusive rights to which are expressly reserved. TUNE brand. Corporate mission statement. The TUNE logo. Logo mark & specifications Usage examples Incorrect usage examples.